What is White Turquoise? 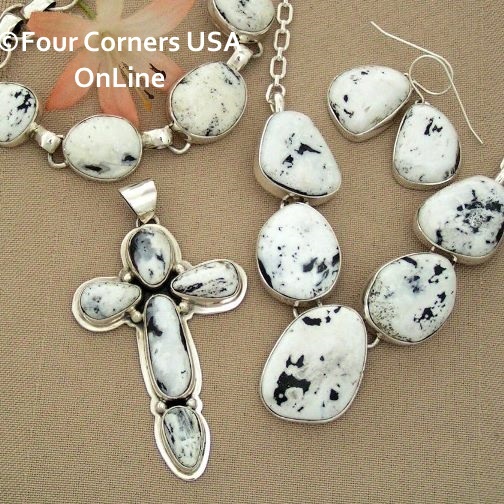 Sacred Buffalo Stone, White Buffalo Stone and White Turquoise are terms often used in describing a Black and White Stone found in Native American Jewelry. What is in a name? More importantly you might ask 'What exactly is the name'? Over the years (most evident recently) we have seen many names emerge for White Buffalo Stone as well as many other stones misrepresented as White Buffalo with some newcomers 'White Horse Turquoise' and 'White Mountain'. We were first introduced to this Black and White Stone at a local shop in Williams, AZ where the shopkeeper had a display case of a few jewelry pieces and one very prominent, not for sale, HUGE Concho Belt. The slabs of stone used in the creation of this belt ranged from 4 to 6 inch easily. He was beyond proud of this show piece and we were in total awe to hear the story which he so willingly shared. Viewing this case of Black and White in a Sea of Turquoise was similar to a black and white image with a single red rose - only in reverse! Over the years our understanding and explanation of this beautiful and unusual stone has not waivered. Reading articles about 'White Turquoise' over the years somewhat reminds me of 'fashion trends' - it always makes full circle and recently we have seen writings that take us right back to Williams, AZ. Although there is some dispute and disagreement over 'White' Turquoise (which we agree with mineralogists), it is a beautiful stone and has become popular amongst Native American Silversmiths and Jewelry Designers. 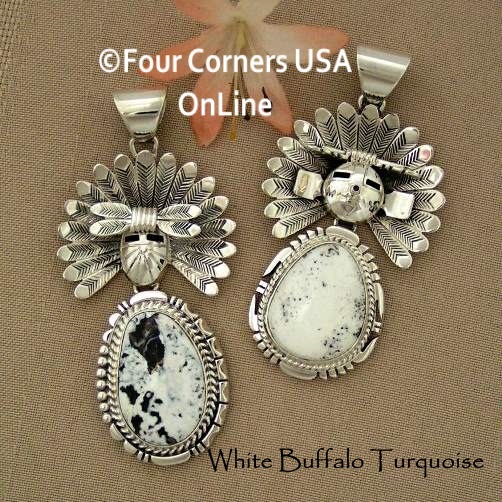 White Buffalo Stone was discovered in the farthest edge of the Dry Creek Turquoise vein. This is likely the reason why many refer to it as 'Turquoise' taking on a simplistic term at the mining site. 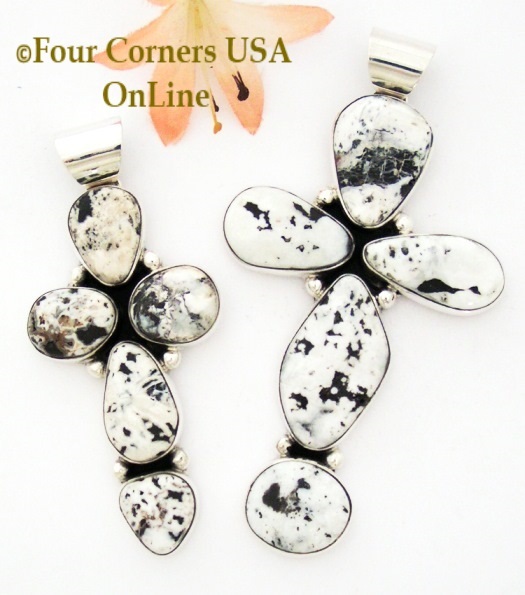 This is White Buffalo often referred to as White Turquoise with it's very distinctive White Background and Black matrix! Mineralogist state it lacks any metal in its composition (which gives turquoise color). Blue Turquoise forms where there is copper present and Green turquoise forms where iron is present. We actually have had some specimens from the middle of this vein where you can see just a hint of color into cream with beautiful golden brown matrix. Most mining operations regardless of what stone is being mined will have a norm or consistent characteristic that is visually associated with it. In reality a tray of stones mined from the same location or vein can have variant color and matrix variations making it very difficult to truly identify specific Turquoise, for example, from a single picture. White Buffalo Stone is beautiful with its striking black & white contrast and to my knowledge this is the only vein in the world. 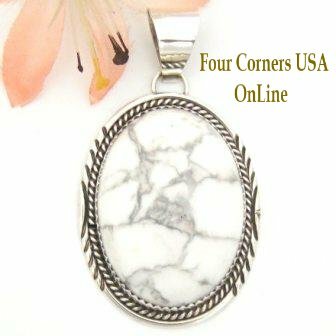 Because this stone is so often and commonly referred to as White Turquoise, you will see many of our listings with the term (and clarification) for web search purposes. Do not confuse Sacred White Buffalo with Howlite (white with gray matrix and much lighter in density/weight) which is beautiful and desirable in its own right but considerably less in value than Sacred White Buffalo. 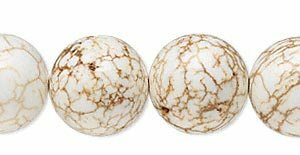 We have sadly seen unscrupulous dealers presenting Howlite as 'White Turquoise'. 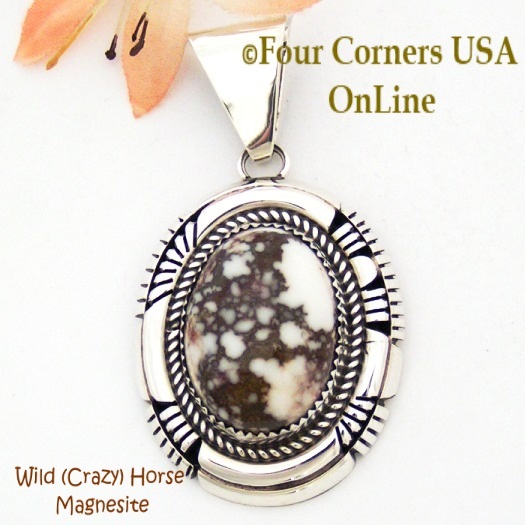 Howlite can be found often in Native American Jewelry as well as cut into various style beads. 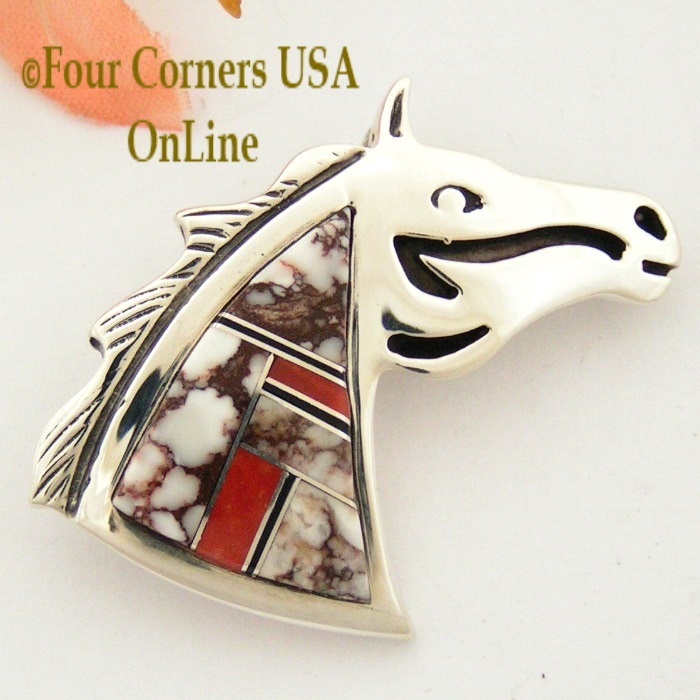 Very pretty stone used in the Southwest for many years but is definitely a different stone than White Buffalo Turquoise. 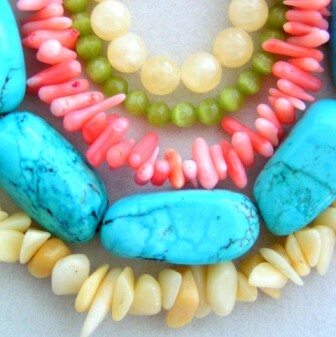 Turquoise-color Dyed Howlite Beads pictured to the left. 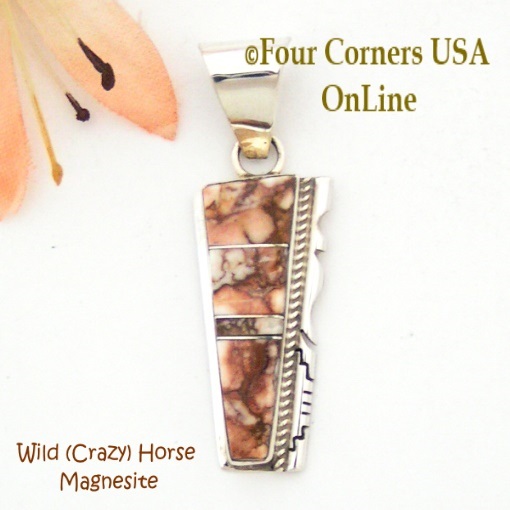 To confuse matters further, there is a magnesite mined in the Gila region of New Mexico commonly referred to as Crazy Horse or Wild Horse. Earlier mined stones such as in this Pendant have wonderful color variation including Whites, creamy beige and pinkish tones. We have seen this referred to as 'White Turquoise' as well as 'White Horse Turquoise'. Whether misguided or misinformed, we have seen sellers call Crazy Horse - Wild Horse Stone and these gorgeous Australian Magnesite Beads (shown in bottom left image) 'White Turquoise' as well. Image below on the right shows what Australian Magnesite looks like when dyed the color Turquoise. 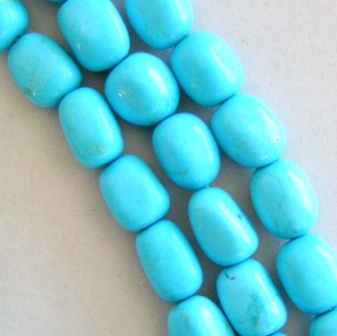 It is clearly different than its counterpart Howlite when dyed.